With immense experience and ample knowledge in this line of work, we are also able to bring forth one of the most exclusive and finest quality column booms to our clients. These Column Boom are basically used for the purpose of providing excellent facility of shifting heavy and bulky industrial material from one place to another in most convenient manner. Column Boom are one of the finest quality products of our company which we are offering to our clients in almost all the regions of the country. 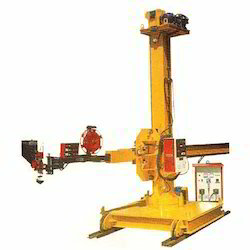 These Column Booms are widely being used in several mechanical industries for works related to rotating, shifting and welding in a full organized manner. These Column Booms are designed and constructed in a very latest and advanced manner with several superb features inbuilt such as 360 degree rotation, easily operable switches and extended base to provide desirable support and stability. Looking for Column Boom ?